This section deals with the Wheels and Tires of the 230SL, 250SL, 280SL of the W113 series of Mercedes-Benz Pagoda's. A wheel (German: Rad, Räder) consists of a Rim (German: Felge) and a rubber Tire (German: Reifen). On the wheels with steel rims, a Hubcap (German: Radzierblende) is mounted. The 230SL was the first Mercedes-Benz passenger car that came with standard radial tires and 14 inch wheels and tires. Up to that point most cars were fitted with 13 inch wheels. The major reason that drove the switch to the 14 inch wheel was the need for powerful disc brakes with larger diameter. The first twelve months of production, 5.5 inch wide rims were fitted, after that 6 inch rims became standard. The 230SL and the 250SL had a two piece Hubcap. The 280 SL is fitted with a one-piece Hubcap. From 1969 Alloy wheels became available as an option. 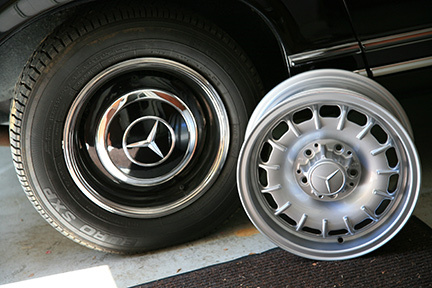 These wheels, also known as Bundt rims, Fuchs (after the original manufacturer), or, in German Barock Felgen (in Dutch: Kroonkurkvelgen) later became very popular on many Mercedes Benz models. The Mercedes-Benz W113 cars have a PCD of 5 x 112. The offset is the distance of the mounting point (the flat surface of the hub) of the wheel from the middle of the rim. This is difficult to visualise. Say you select a wheel that is 6 inches in width – that’s 152.4mm wide. Where across that width is the mounting face of the hub located? Is it half way across the width, or is the hub face located towards the outer edge of the wheel or the inner edge of the wheel? If the hub face is half way across, the distance that the hub face is in from the back of the wheel will be 76.2mm (152.3 / 2 = 76.2). In this case, the wheel will be said to have zero offset – the hub mounting face is half way across its width. In this diagram, the black centre line of the wheel is equal to an offset of 0. 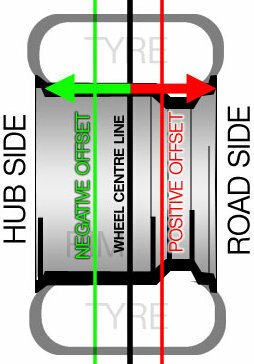 This means that if the hub is positioned directly in the centre of the wheel, the offset is 0. Every other offset is then measured from this line. If the hub position is instead closer to the middle of the car, more toward the 'hub side' according to the diagram, i.e. where the green line is, the offset will be negative. (This is not common.) 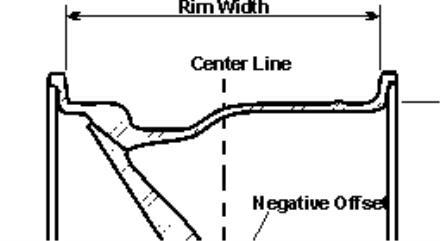 However, if the hub position is more toward the outer rim or the road side according to the diagram, i.e where the red line is, the offset will be positive. It is more common that the offset is positive and for most road cars it is between 15 and 50. The standard offset for a Pagoda wheel is 30mm positive offset (frequently called 'Einpresstiefe' ET 30). Offset is important because if it is wrong for the application, it can change the clearances between the tyre/wheel and the suspension members, or the clearances to the external bodywork – both of which could cause rubbing. Furthermore, it can also alter the steering geometry (specifically, scrub radius), which can cause unwanted steering effects. So if the wheel is 203mm wide and the backspace is 151mm, from the formula: 151mm – 101 = 50mm offset.